Today, we visited the temples of Agrigento and the house of Luigi Pirandello in Caos in Agrigento. The temples of Agrigento, similar to those in Selinunte, were very impressive, and clearly exhibited the competitive arms race of the ancient Greeks. After the temples, we quickly stopped by the museum associated with the temples to find one of the “Telamon”, or one of the massive statues of men placed on the facade of the temple, which was an original from the Temple of Jupiter, I believe. After a bite to eat at a local cafe, we made our way to Caos in Agrigento, the town of Luigi Pirandello, to look at his tomb and childhood home. 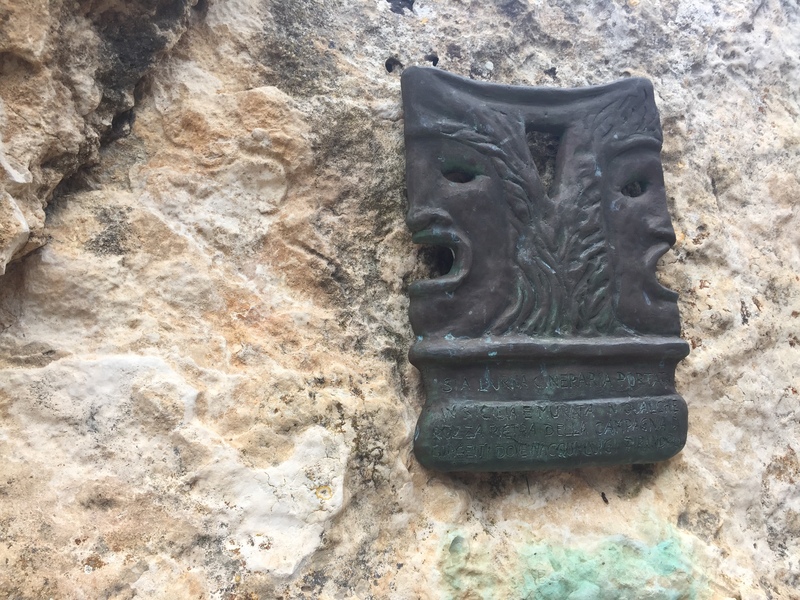 On Pirandello’s tomb, a small iron-clad slab with two opposing faces, pictured in this post, rested on the front of the abstractly shaped boulder on top of the final resting place of his ashes. These faces served to represent Pirandello’s recurring theme of people always carrying masks to conform to the constraints of society. When we walked through Pirandello’s house, we found many of the paintings done by his family, especially those of his son and sister, as many of his family members pursued the arts. After visiting Pirandello’s home, some of us decided to take a walk on the beach adjacent to our hotel, dipping our toes in the clear, but frigid Mediterranean. For dinner, we found a wonderful restaurant on Via Roma in Porto Empedocle, and I ate some dishes “del mare”–polpo arrosto (roasted octopus) e spaghetti al Nero di seppia (spaghetti with squid ink).